Situated in Palm Valley, just off County Road 210, also known as Palm Valley road, residents of Odom’s Mill enjoy the closeness of area schools, shopping and the beach without the more pricy dues of golf course and gated communities. 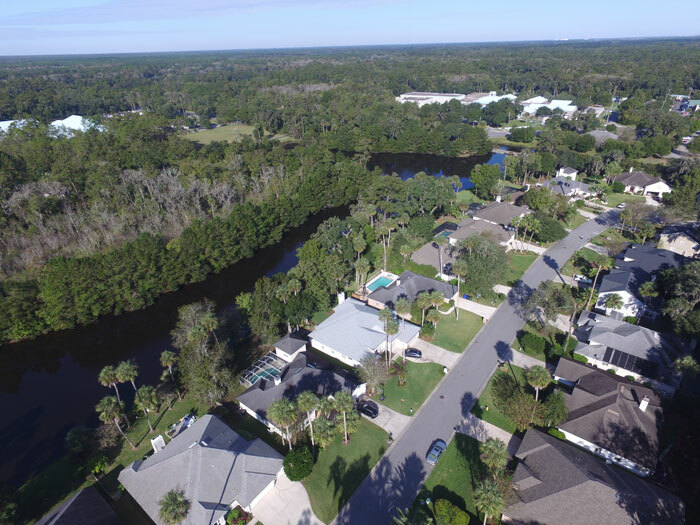 Designed with its locale in mind, Odom’s Mill features lake front and nature preserve lots and a community path that leads directly to Landrum Lane on the west side of Ocean Palms Elementary School. This path can also be utilized to walk or bike to the local YMCA or Landrum middle school. Homes in the community largely have the same architectural and landscaping style, creating a unified look throughout Odom’s Mill. Oaks and Palms are featured in many yards of this planned community giving it a nice balance between manicured landscaping and the surrounding natural growth. The community is deed restricted, governed by a board of directors and subject to various guidelines and controls put in place by the Odom’s Mill Community Association. Clearing of trees and natural growth to make way for homes in the neighborhood is minimum. This gives a canopy effect to many of the trees, which are lined by naturally occurring plants. You won’t find carefully spaced palms here—the neighborhood has the look and feel of stately Old Florida without less artifice than some neighboring communities. Shade abounds on the streets. Lots are cozy and well maintained. The abundance of shrubs, landscaping and natural trees provide a nice level of privacy from lot to lot. Although some homes are very close to their neighbors, the natural assets of the neighborhood prevent a feeling of being too close for comfort. A sidewalk runs along Palm valley Road connecting Odom’s Mills walkers and joggers to Landrum Lane, the roundabout and even the beach. You won’t find fences in this neighborhood—just lovingly maintained gardens and open yards shaded by oaks and clusters of tall palms. Lots have been placed to make the most of the water in the neighborhood, which includes one large meandering body of water that spans the neighborhood and a smaller pond on the north side. Rather than have students travel to school on the busy CR-210, Odom’s Mill features a community path that leads directly to the neighboring middle and elementary schools, Landrum and Ocean Palms. This path can also be utilized to walk or bike to the local YMCA, which offers impressive amenities such as a large lap pool, outdoor rock wall, group exercise rooms, new gym equipment, a yoga studio and a large gymnasium facility. People young and old take advantage of the YMCA’s many programs that run all year. Residents also have the use of the sidewalk flanking Odom’s Mill Blvd that leads to the community pool and playground. Parking is provided making for a quick commute for those who would rather drive. Once there, residents can enjoy the pool open from April to October, relax under the large elegant pergola or partake in a game of basketball on one of the courts. The neighborhood is formed by four large streets—Odom’s Mill Boulevard, Mill Cove Lane, Big Tree Road, and Mill Stream Road—with small cross streets and side streets such as Micklers Dam Court. The larger roads have gentle curves to accommodate the landscape and homes along these roads tend to have larger lots, with the largest homes naturally on the water. Smaller lots can be found toward the back of the neighborhood where homes are more dense—perfect for parents looking for the best security for their children and the most playmates. Short side roads with dead ends give homes in this area a village-like feel, making them quite welcoming for families. It’s definitely easy to find playmates in Odom’s Mill. The community is just minutes away from a Publix supermarket and The Fresh Market, as well as all of the fine dining, shopping and entertainment that Ponte Vedra has to offer. Odom’s Mill’s position off of 210 make it a quick drive to both St. Augustine and Jacksonville, which makes world class shopping easy as well as world travel with just a 45-minute drive to the Jacksonville International Airport.